Even before having a family of my own Family Fun magazine has always been one of my favorites. I subscribe to a number of magazines but Family Fun is one that I save each issue to refer to later. It always has lots of fun activities, recipes, and crafts to do and make with the kiddos. 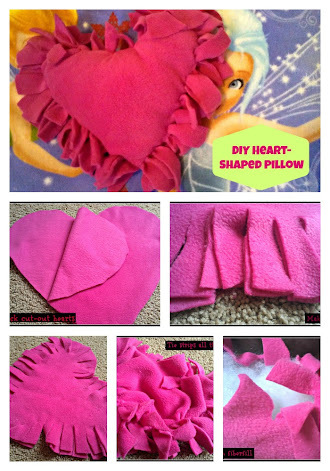 In their recent December/January edition they had some cute DIY gifts that kids could make and one suggestion was for baseball and football knotted fleece pillows. As soon as I saw them I knew I’d love to do a heart-shaped one for Valentine’s Day. One of the best parts of this craft project is how quick and easy it is to complete. Bubbles generally naps for about 45 minutes and I had time to do a couple of chores before sitting down to make the pillow. I think they’re really cute and will be a nice homemade addition to Bubbles’ Valentine’s gift. To start you need to cut out your first heart. You could certainly print out a template but I chose to do mine freehand. 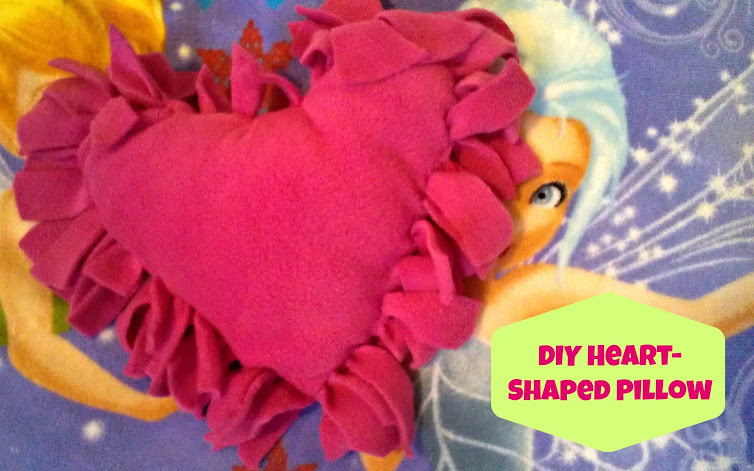 I folded the fleece in half and drew half the heart shape coming off the folded edge. Tip: Make the heart bigger than you think you want. It’s really going to be about three inches smaller all the way around when you’re done. I cut it out along the line I drew, unfolded the material, and had a full heart (a lot like the ones you made in elementary school). 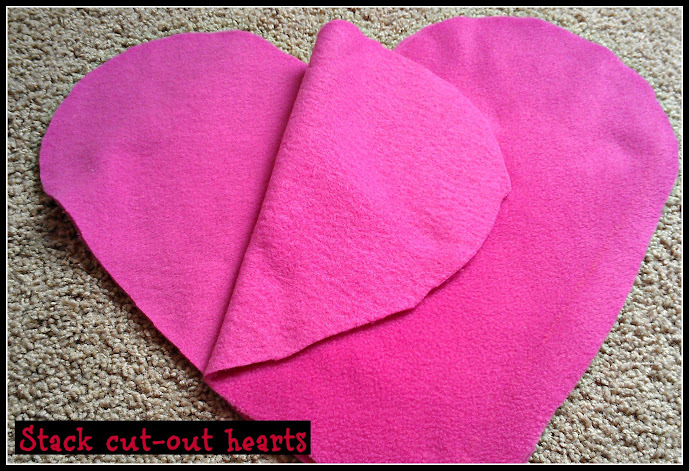 Then I placed the heart on top of another piece of fleece and traced it. After cutting it out, I laid the two heart shapes on top of each other. Don’t worry if your edges aren’t 100% perfect or don’t line up exactly edge to edge; you’re not going to be able to tell when it’s done. Leaving the material stacked you’re going to start cutting around the edge of the heart. You want to space your cuts roughly an inch apart and make your slits roughly three inches deep. The article suggested that you, you know, measure. But the thought of it was a little tedious for me, so I winged it and it turned out just fine. Do make sure you’re cutting down the full three inches, though, because you’re going to need to tie the strips together at the end. 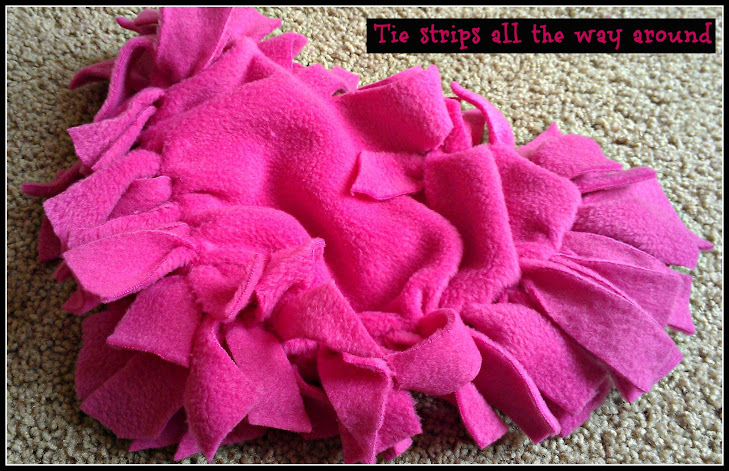 Start knotting the strips together, working your way around the pillow. You’ll want to leave a gap open at one end in order to stuff it before you finish. I recommend leaving the top open as it will be a bit wider and easier to fill. It might look a little odd or puckered but that’s fine. You’ll have a chance to straighten and fluff it at the end. 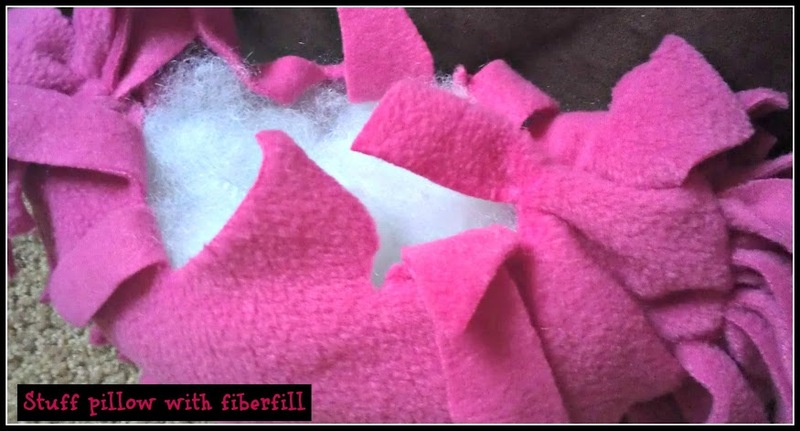 Fill your pillow form with fiberfill. Use your fingers to tuck it into all the corners and spread it around evenly. Once you’re happy with the shape of your heart, finishing knotting your last couple of strips. Then take a minute and go back around to make sure all the knots are still tight after filling the pillow. That’s it! 30-45 minutes and you’re done. If you want to personalize them even more consider adding the recipient’s name with iron-on letters or using embroidery floss to blanket stitch it on. 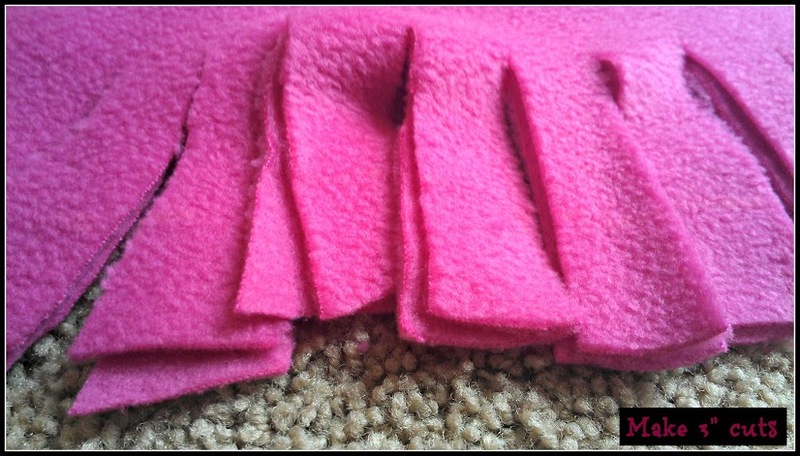 You could also use two different-colored pieces of fleece, like pink and purple or white and red, to give it extra pop. I can’t wait to see what Bubbles thinks about it. I have a feeling her baby doll will be resting her head on it while lying next to her. What are your favorite DIY crafts for Valentine’s Day? Adorable! This is such a cute project. What an adorable idea! I love this! Super cute!! I love fleece! Cute little pillow! And it looks really easy to make. Aarrgh, CUTE. And my four year old could do it! This looks so easy, yet has so much “pop” to it! I think I’ll make one for my niece’s birthday. She’ll love it! That’s looks really easy, and fun. Why couldn’t I have seen this post before Valentine’s Day? I love these pillows. I bought two square ones and the material to make them. Thank you for the tutorial! This is a cute idea…great craft to do with the kids since it is no-sew! I love this! It would be a sweet gift for any occasion! That is really cute! My daughter likes to sew and make crafty stuff. I bet she would love to make these pillows! What a fun and easy craft. So great for kids. I love that! I always want to do something with the boys and this would be perfect. it doesn’t have to be for valentine’s day and they could pick their own fleece.